Take advantage of the panoramic beauty that nature has to offer on a romantic afternoon hike with your partner. Best of all, you don't have to spend a lot of money for this ideal outdoor date. The United States is home to a multitude of national parks that are full of beautiful hiking trails. However, you don't have to travel to a national park to enjoy an afternoon of hiking; many cities and towns offer trails that you can use for a romantic getaway. Gentle terrain will let you focus more on each other and less on steep climbs. Choose a hiking trail that fits your particular interests. 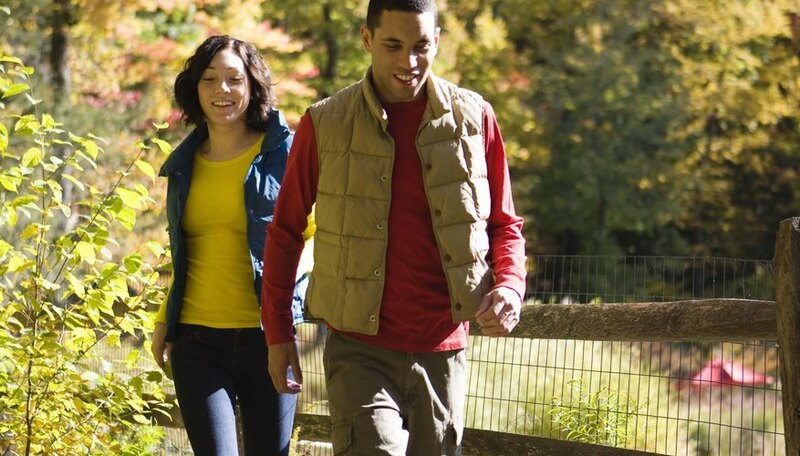 If you are still getting to know your partner, consider choosing a hiking trail that is near your home. For couples who are more intimate, opt for a hiking trail that requires a long drive and enjoy the additional time together on the road. Research the terrain to find a hiking trail that coordinates with your activity level; a modest incline with plenty of trails suits a leisurely afternoon of hiking, whereas steep inclines and rough terrain will give you both a workout. Pack all of the essentials that you need to make the afternoon romantic. Make a picnic lunch and a dessert fit for couples, such as chocolate-dipped strawberries, and pack the food in your hiking bag along with a blanket for relaxing. Include water bottles and a flashlight just in case it gets late. Bring a digital camera so you can take pictures of the beauty you encounter. Stop and smell the roses. Nature is very romantic so make sure you pause along the way and take it all in. Lay in the grass for a short rest or sit underneath a tree and hold hands for a while. Watch for wildlife and take time to observe all of the surrounding plant life together. Get to know one another. Hiking can provide you with peace and quiet that many people struggle to find in their daily lives. Take advantage of the silence of the woods and get to know your partner on a personal level. Talk about hopes, dreams and future plans, or share some childhood memories as you wander along the trails. Taylor, Kate. "How to Have a Romantic Afternoon Hiking." Dating Tips - Match.com, https://datingtips.match.com/romantic-afternoon-hiking-13196831.html. Accessed 22 April 2019.